Teas offer us so many health benefits—inside and out. 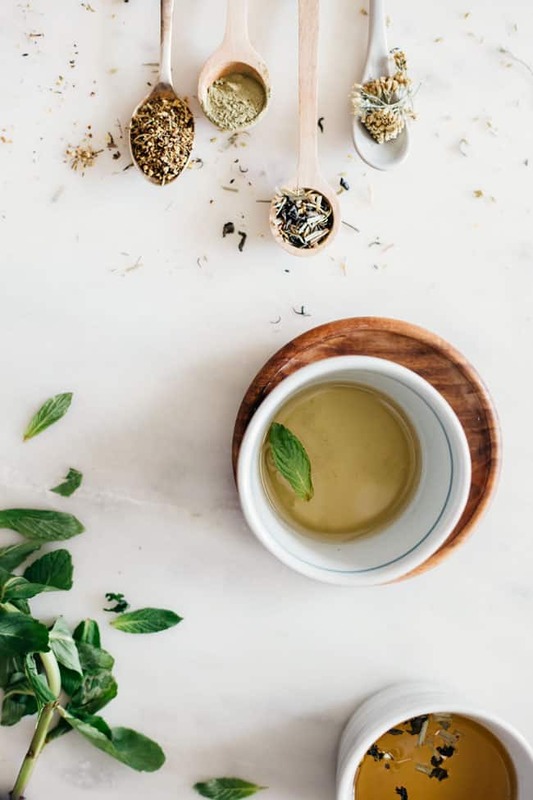 Some teas can reduce bad cholesterol and lower the risk of heart disease, while others have anti-bacterial properties and can combat sleep issues. But, did you know that teas are also great for our skin? There are so many to choose from and each work in their own special way to keep your skin looking beautiful. And, you can drink, apply directly to your skin, or use extracts to see benefits. It all starts from within. When your insides are working properly, it shows on the outside. 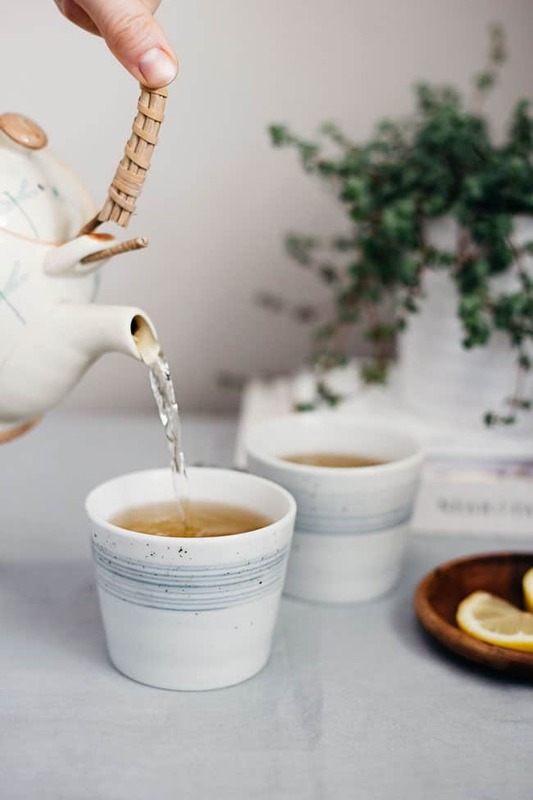 And most importantly, tea starts with water—the most essential part of keeping skin healthy. People have been drinking tea for thousands of years, and it’s clear why. Sleep is imperative for glowing skin, which may make chamomile the most popular tea for skin. When we aren’t sleeping well, the mirror will show you the effects. Next time you see dark circles creeping up, put some chamomile tea bags on your eyes to calm puffiness and the tired look. It’s relaxing properties also make this a great tea for red, irritated skin. And not only does chamomile promote relaxation and sleep, it’s full of quercetin, which protects your skin from the sun’s harmful damage. Try it in this Garden Chamomile Tea. Not only does it smell beautiful, jasmine tea actually has antiviral and antibacterial properties to keep your immune system healthy. It can prevent the signs of aging and even treat skin conditions like eczema and acne by reducing oil production and balancing hormones. Green tea is also packed full of sun-fighting agents. Too much sun exposure can increase your risk for skin cancer and quickly age your skin. Green tea’s free radical-fighting catechins, EGCG, can reduce skin damage and prevent wrinkle formation. These powerful catechins have also been shown to revive dying skin cells and promote healthy new cells. Try it in this Green Tea Energy Drink. Also known as the Red Bush Tea, rooibos has been used for thousands of years in South Africa and can be used to treat a variety of skin conditions. It’s thought that the flavonoids in rooibos fight unwanted pathogens and can keep eczema and acne flare-ups at bay. This red tea even fights against aging signs, thanks to superoxide dismutase. It works to neutralize free radicals and slow the appearance of fine lines. Try it in this Rooibos Sun Tea. Packed with antioxidants, black tea fights free radicals in the body and slow the signs of aging. It also has anti-inflammatory properties and encourages a healthy immune system due to the high caffeine levels, which can prevent colds and viruses that negatively affect our skin. Next time you’re thinking about enjoying a cup of tea, try applying a cool black tea rinse directly to the face. Dandelions aren’t just weeds that take over your garden. They’re delicious in salads, make great tea, and have amazing benefits for your skin and internal organs. Dandelion tea is full of antioxidants and immune enhancing properties that help your skin stay young and fresh. It can also aid digestion, which affects the appearance of skin. Ginger tea is full of anti-inflammatory power to aid your digestion and your skin. It’s been shown that when the digestive track is off, skin can also suffer and annoying skin conditions can arise. Ginger also helps prevent colds, which can weaken our immune systems and affect our outer beauty. This tea helps more than just an upset stomach. The menthol in peppermint makes this tea a great choice for oily skin by slowing oil production and encouraging cell turnover. This gets rid of dead skin cells and makes your skin stay consistently glowing. It can also boost estrogen levels in some people, which can fight acne and hormonal issues. White tea has even more antioxidants than green tea and has the highest catechin content! This is because it’s the least processed type of tea. It has great antibacterial properties that can fight several types of skin conditions. Our skin contains an enzyme, matrix metalloproteinases (MMP), which increases with age. White tea prevents the increased levels of MMP from decreasing collagen and elastin—both necessary for healthy skin. With benefits from both black and green teas, oolong tea really has a unique taste unlike other teas, but it’s full of health and beauty benefits. It can improve the color of your skin, reduce dark spots, and might even help fight sun and smoking damage. This makes this tea definitely worth trying! Kombucha tea, made from fermented black tea, is great for detoxifying the skin. It contains plenty of antioxidants and probiotics, and it’s great for reducing fine lines and improving skin elasticity to make your skin look vivacious. It can even be used as a topical astringent and treatment for sunburns. Originating from Japan, this bright green tea is rich in nutrients and known for detoxifying the skin. It contains antioxidants, chlorophyll, and natural antibiotics, along with catechin to help fight bacterial infections. Matcha powder is becoming very common in face masks, creams, and lotions, but you can still drink a cup to reap the benefits! Try it in this easy matcha latte. Hi! Great post! Just a complete different question.. the white mug with blue lines around it, which brand is it from? They are gorgeous! Thanks! What tea should I drink for red irritated and acne prone skin? I’m 16 years old. Can you add sugar to it or you drink it natural..would sugar hurt the benefits..
Sugar is not advisable..You can use Honey instead of sugar. Agave nectar is fantastic too, with a low glycemic index. Though, honey has some great benefits- especially local honey! Black tea. I use it to rinse my masks. Hey! Chamomile tea is so far the best for skin alongside Green tea and Earl Grey. I’ve been drinking this korean aloe vera tea and it works great as well! Though the most important thing is your skin care, diet and be sure to drink enough water everyday ? I am so excited to do your process on making tea. I like it. Thank you for sharing and Good day. Would adding a tespoon of honey effect the tea? Great list! I have peppermint growing in the yard. I definitely have to try it as a tea. I’m a little surprised that bamboo tea isn’t on the list. Since bamboo is so high in silica, it gave me really good hair, skin and nails benefits. When I heard of bamboo tea, I found a brand called Beautifully Bamboo and loved it! Nails were strong, hair healthier and it definitely made a difference in my hair. Matcha is also one of my faves. I just love the taste and the extra energy boost. I’m so grateful to have peppermint, chamomile and lemon balm growing in my yard that I have dried and make my own tea from it. See this is why I LOVE herbal teas – they each have a whole variety of amazing benefits. Like seriously, is there anything chamomile tea doesn’t do?